According to a recent article in Medline Plus, The National Institute of Health has published some possible reasons for having nightmares. The short article by Diana Kohnle, was disseminated by HealthDay and explained that nightmares are usually more of a problem for children than adults. "Being stressed or anxious, often resulting from a significant life event. Withdrawing too quickly from alcohol use, or drinking too much alcohol. Having a sleep disorder, such as narcolepsy. Being sick with a fever. Eating too close to bedtime, which raises your metabolism and increases brain activity. Having a side effect or reaction to a drug." I believe the reason why nightmares are more of a problem for children is because children are much closer in time to the 'life event' which is the source of their nightmares. The ultimate cause of nightmares is birth trauma or other severe early trauma. Adults have had much more time to build good defenses against their catastrophic birth pain. Even when adults have nightmarish dreams, it might be a "significant life event" which recently disturbed them, but the ultimate cause remains a pre- and peri-natal event which remains stored in their brain in a pristine condition. Having a side effect or reaction to a drug. All of the drugs below, and others, have been implicated in causing nightmares. The list is not short. - From Drug Causes of Nightmares. As a child, having a fever was an open-ended invitation to my mind to conjure up its painfully sadistic "twisting sheet routine." The scenario would occasionally occur when I had a fever and was in a zone between asleep and awake. I assume that a febrile illness lowers one's defenses making repressed trauma easier to access. At that time, I would have hallucinogenic movie episodes of a twisted sheet that would continually replay in my mind like a 5 second looped length of video tape. Each segment would end with my complete identification with what I was "viewing" - the symbolic reliving of maximal, almost unendurable, pressure and upper body twisting and turning. I was experiencing what I was seeing and seeing what I was experiencing. My body had been in its external rotation phase of birth, although it had seemed as though the sheet covering my birthing bed was twisting instead of me! When the image of the sheet became twisted to its maximum, the psychological pain also increased in severity and when both were stretched to their limits the experience shut off and then immediately rewound to the beginnings of the storyline as the nightmare sheet image began to slowly but inexorably tighten-up once again. During birth I must have felt a complete identification with what I saw in the dream state as a twisting sheet accompanied with feelings of pressure, nausea and dread. Again and again, when the scene arrived at the point of maximal twisting, the scenario would again freeze the frame and then run off the sequence, once again, from its beginning. At that time the sheet upon which I was fitfully resting took on the aggressive qualities of my nightmare. It also was twisting and torturing me. The fever induced torment was repeated until I could force myself out of my semi-conscious dream state. "You may be an undigested bit of beef, a blot of mustard, a crumb of cheese, a fragment of underdone potato. There's more of gravy about you than of grave, whatever you are." Obviously, the food itself does not contain the feelings which are part and parcel of the apparition of his former business partner. The feeling content of a nightmare is the result of the activation of a history already recorded in the brain. The "increased brain activity" becomes an aid in unrepressing the early material which is expressed in Scrooge's vivid night terrors. A commonly symbolized representation of the oppressive nightmare of suffocation by chest pressure is typified by the night appearance of the Incubus or Old Hag syndrome, which is played out by sudden awakening from a nightmare. I have never read of a child having the incubus nightmare, but there is no reason why it would not occur. The dream is one of oppressive suffocation by chest pressure. 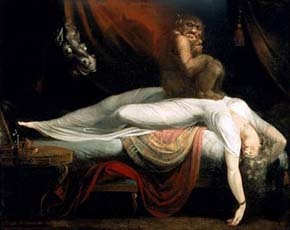 During the night terror, the dreamer is startled awake, breathless and terrified and being unable to move as a result of a "presence" sitting on the subject's chest, interpreted by the dreamer as a demon or "old hag." This paralytical visitor experience is, plausibly, a fragment of a birth nightmare of which a component originates from when the dreamer was stuck in the birth canal, with resultant compression of the umbilical cord and interruption of its oxygen supply. The bad dreams which the non-drinking alcoholic may temporarily suffer, are the result of a rebound effect of the withdrawal of the alcohol "medication" which had tranquilized away the effects of severe traumas. The traumas from which a drug addict suffers are more severe than those of an alcoholic. Thus alcohol might be not strong enough to tranquilize away the effects of one's high valence birth traumas. In such cases opioids and heroin could come to the suffering addicts rescue and disconnect him from the effects of his pain. One such event can trigger the roots of the feelings to which it is attached by some sort of resonation. For example, rage in the here and now can tap into the fetal rage which one experienced while being born. This rage at the sufferings of birth can mobilize one's determination to complete the birth process or if the sufferings are extended can trigger in the fetus a wish to surrender to death to stop the suffering. Here also lies the origins of a tendency to depression and of a subsequent lure to kill oneself (Arthur Janov, Ph.D. The Janov Solution: Lifting Depression Through Primal Therapy, 2007 - Book Review). Is it any wonder that the child or adult can unconsciously remember his battle - his most 'significant life event' - getting born - and how the memory of this effort can be repeatedly symbolized in terrors while asleep?